Google has pretty much managed to steal the attention away from all the CES 2019 hardware exhibitors with minimal effort, as the search giant’s voice assistant is literally everywhere nowadays. But the company’s flagship product is also getting a notable upgrade while the Las Vegas action continues to wind down. We’re talking about the world’s most popular search engine, which believe it or not, is making further progress in anticipating your actions and helping you retrace your online steps. It may have taken quite a bit longer than anticipated, but those neat activity cards previewed way back in September are finally rolling out (today!) on the mobile web and the US-specific Google app in English. No words on international availability yet, let alone support for other languages, which is a pity, because this feature sounds pretty awesome. What it essentially does is remember your every query (when logged into your Google account), bringing back past results when you search again for the same stuff or use similar terms. This way, you can easily find old recipes you used and loved but never bookmarked or, on the contrary, avoid wasting time on forgotten information that didn’t prove very useful. Google never forgets, which might come in handy or scare the bejesus out of you. If you’re part of the latter category, don’t worry, as this is a feature you can disable after tapping the 3-dot icon. Controlling what appears in your activity card is not very hard either, while “collections” of items obtained by repeatedly searching for related topics can be accessed through the bottom bar of the Google app or by tapping the menu on the top left of the regular Search mobile webpage. 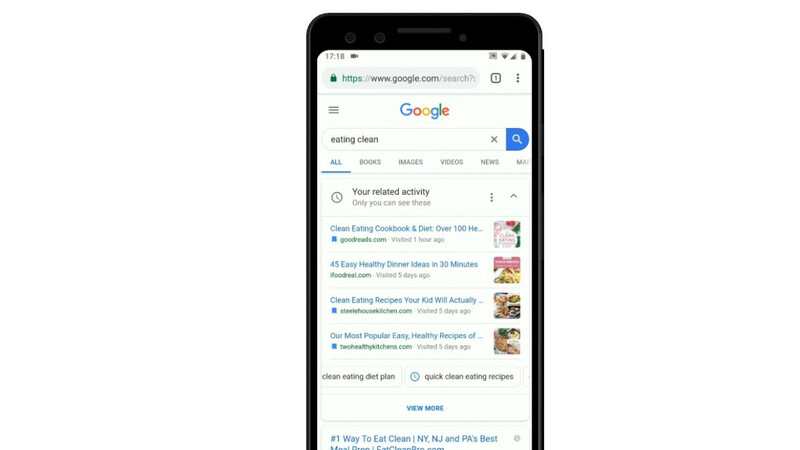 The new Google Search activity cards are billed as a great way to “build new habits or pick up new tasks in the new year”, sounding particularly convenient for cooking, interior design, fashion, beauty, fitness, and photography enthusiasts.